What do you do with your Christmas cards at the end of the festive season? By tradition cards and decorations should be taken down on 6 January, Epiphany. E-cards and Facebook messages may be convenient, but they don’t have the same appeal as a personal card, and they certainly haven’t reduced the number of cards delivered to my house. I always feel a little sad taking them down, often the only communication I have with old friends and far-flung family, and instead of popping them in the recycling bin, I tend to hold onto them for a while. 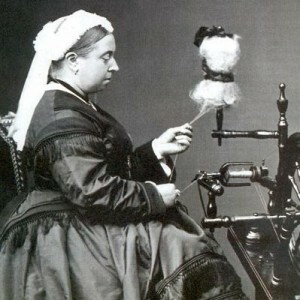 So how must actress Helen Faucit have felt about the Christmas cards she received from Queen Victoria? In the Shakespeare Centre Library and Archive is an album containing 23 cards, some of which have the appearance of being handpainted, from the Queen, bearing her Christmas wishes from the 1870s until the 1890s. How did this album come to be where it is now? Helen or Helena Faucit, was one of the greatest actresses of her day. Born in 1814 to a family of actors, she made her reputation in around 1836 playing with the great actor Charles Macready, who considered her “beyond all compare the best English actress”. At her peak in the 1840s she performed most of Shakespeare’s leading ladies, including Rosalind, Lady Macbeth, Imogen, Desdemona, Juliet, Beatrice and Portia. The lawyer and writer Theodore Martin met and fell in love with her, and after an eight year courtship she eventually agreed to marry him. She continued to perform these youthful roles after her marriage and into her fifties. Her final two performances were, notably, the very first performance at the Shakespeare Memorial Theatre on April 23 1879 when she played Beatrice and a few months later when she played Rosalind for a fellow-actor’s benefit in Manchester. She was 65, but was still highly regarded in these important Shakespearean roles. She must have remembered the opening of the theatre in Stratford-upon-Avon fondly in later life. 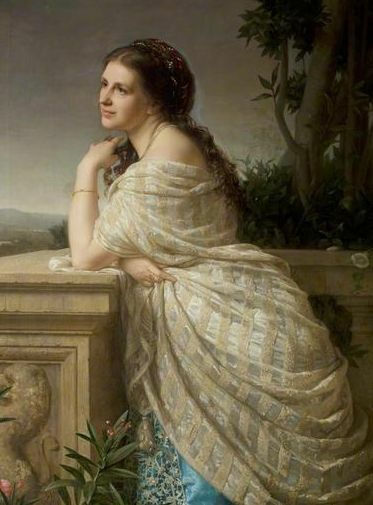 At a time when the acting profession was still widely regarded as disreputable she brought refinement, and made friends among the aristocracy as well as becoming friendly with the poetry and drama-loving Queen. After Prince Albert’s death, her husband was commissioned to write his official biography and when this was published in 1880 Martin was knighted making her Lady Martin. Such respectability was unheard of for an actress: it would be another fifteen years before an actor, Henry Irving, was knighted for services to the theatre. Helen Martin herself wrote “Letters”, actually essays, on some of Shakespeare’s heroines using her insights as an actress who had performed them. The first, on Ophelia, was published in 1880, followed by others on most of the characters listed above, concluding with an essay on Hermione in The Winter’s Tale. When young, her acting tended to be over-dramatic, but she learned to keep her power in reserve, and her great talent became the subtlety of her acting, suggesting suppressed emotion and complex unspoken thought. Critic Joseph Knight called her “the greatest interpreter of the poetic drama that living memory can recall”. Although people often wrote to each other at Christmas, the idea of having a card to send to all your friends, bearing a seasonal message, was only invented in 1843. The first cards cost a shilling (5p) each, a significant amount, and they were slow to catch on until the introduction of a cheap halfpenny postage rate was introduced. The Queen herself sent thousands of cards, but most of the ones in the album don’t appear to be “official” greeting cards, and the fact that Helen Faucit kept them so carefully indicates that they were personal gifts. 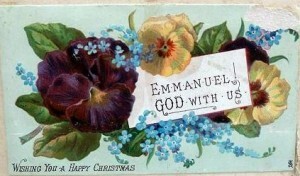 Like many Victorian cards they don’t fit in to what we today consider “Christmassy”, the most common subjects being spring flowers, but these little cards were real symbols of the friendship between the two women. Helen Faucit died in 1898, and some of her treasured possessions, including the album of personal cards from Queen Victoria, were passed to the Memorial Theatre in which she had performed on its opening night. Her biography was published by her husband, Theodore Martin, in 1901, the year of Victoria’s death. Over the next few weeks I’m going to be writing a series of posts about other distinguished Victorian women with Shakespeare connections. This entry was posted in Legacy, Stratford-upon-Avon and tagged cards, Christmas, Helen Faucit, Queen Victoria, Shakespeare's Heroines, Theodore Knight, traditions. Bookmark the permalink.